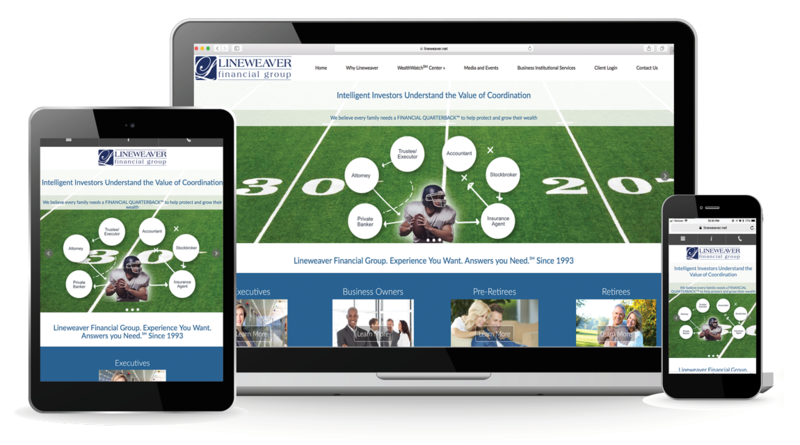 We are excited to announce a launched re-design and re-imagined site for Lineweaver Financial Group! 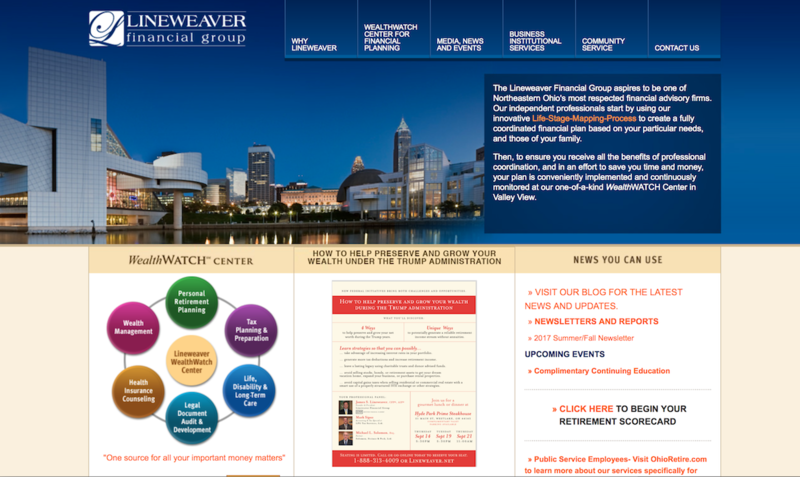 Lineweaver Financial Group is one of Northeast Ohio’s most respected financial advisory firms. Virteom was able to freshen and update the skin of the site, while keeping page content intact. Our goal was to create a design that would allow them to speak directly to their market, define a clear path to their latest media appearances, put their events front and center and make it easy for their clientele to access news. Their old site had become a little dated and was not mobile friendly. This design gives their site a modern, updated feel, and it can now be accessible on any device. It was really important for Lineweaver Financial Group to have a site that spoke to their clientele. Through persona development we were able to identify what information these “buyers” typically look for when they visit their website. This allowed us to define clear paths for their typical users (Executives, Business Owners, Pre-Retirees and Retirees), determine the correct size / face of fonts, and provide all the information they need on one page. Another great addition to this re-skin is the home rotator. Virteom was able to put together a custom module for their home rotation to work in layers. This allowed us to place an image in the background and layer other photos and text on top of it. Lastly, we really love the bold use of text, photos and colors. These design choices align with the latest in web trends. We believe this new site give the user a better experience. But don’t just take our word for it! Read their blog post! The great thing about Virteom is that once your site is built we don’t abandon you. We are here for our customers to promote post-website launch efforts. Lineweaver can sleep well knowing a team of web developers and marketing professionals are behind them supporting their website goals, whether that's expanding their website footprint, or fixing any issues that arise. How Can You Get Started with Virteom? It’s easy! Fill out the form on this page, “chat with us” using our website’s chat box, or give us a call! We look forward to getting started with you! And....we're off to the next project!